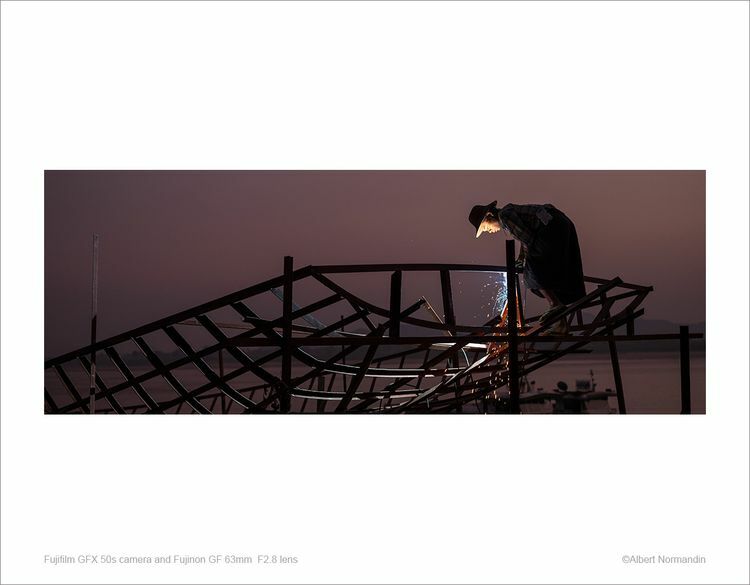 As the evening turns to night, a lone worker continues to weld the skeleton of a riverboat on the banks of the Chindwin River in Myanmar. No real safety gear and crude tools at best, the job continues until the ship is complete. Manual labour is the force that continues to drive the country. Most work for little money and barely scrape by as they struggle to support their families. Deep fading light, with unpredictable moments of bright flashes and a subject that continues to climb around, are the challenges. But with the Fuji GFX 50s camera, I have all the confidence to get that one moment that just may be the “ONE”. Produced with the Fujifilm GFX 50s medium format mirrorless camera and the Fujifilm GF 63mm F2.8 lens. Produced with the Fujifilm GFX 50s camera system. With thanks to Fujifilm Canada and Beau Photo Supplies.